This High Arc Swivel Spout Two Metal Handle is Certified lead-free so the water sitting in your faucet cannot leach the lead out of the brass and enter your water system so this is guaranteed to deliver clean and healthy water to every household and heavy duty for durability and reliability. Easy to install two handle kitchen faucet so you have a greater control over the water flow and the temperature. With hassle-free, interchangeable Gerber parts. A high-quality faucet that matches your fashionable bathroom style. With an exceptional color that prevents tarnishing and corrosion. Easy to clean and maintain full chrome plated finish to ensure years of reliable performance. High spout that allows easy access to the sink and works great for cleaning or washing cookware and food. Tested with high water pressure to ensure high quality and durability. ADA (Americans with Disabilities Act) compliant, more accessible to people especially persons with disability. 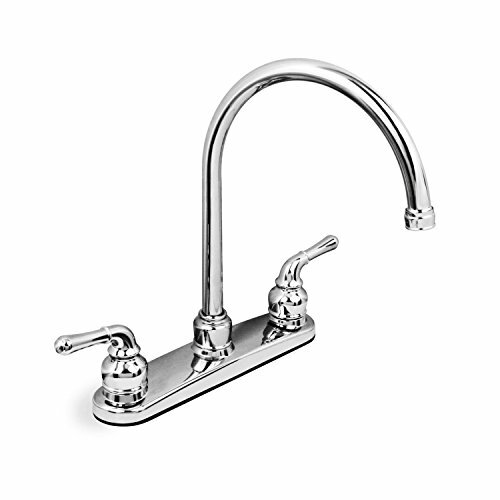 The 2-handle lever design makes it easy to operate, while the High-arc spout leaves plenty of room for washing hands. Made for efficiency, this faucet is also WaterSense certified to conserve water in a sustainable, functional style. A sleek high-arc spout that is a welcome upgrade to any kitchen. Convenient side spray makes clean up a breeze. Quality solid brass construction with a water saving aerator, backed by Limited Lifetime Warranty. If you have any questions about this product by Everflow Supplies, contact us by completing and submitting the form below. If you are looking for a specif part number, please include it with your message.